Dalton Ferguson with his wife and daughters. An Iowa football player is tackling much more than X’s, O’s, and school work this season. 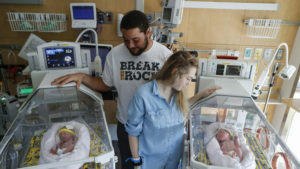 Senior offensive lineman Dalton Furgeson and his girlfriend, Rachael, became parents to twin girls last month. Ella and Hazel were born five weeks premature. After spending a lot of time in the UI Children’s Hospital, Ferguson told KCRG-TV that his daughters now at home – gaining weight and strength every day. “They’re doing really well. They’re gaining about one-and-a-half to two ounces a day, so they’re making good strides,” Ferguson said. The girls were born on September 7. The next day, Ferguson was in the starting lineup as the Hawkeyes beat Iowa State. 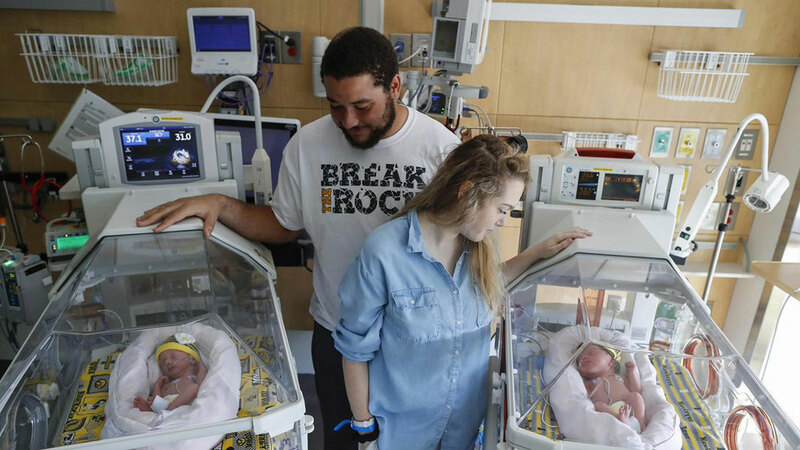 He took part in an emotional “wave” at the end of first quarter as Rachel, with their newborns, watched from the hospital overlooking Kinnick Stadium. Now, they’re at home with the babies, who are keeping their parents busy day and night. “No sleep, waking up in the middle of the night,” Ferguson said with a laugh, “but it’s all worth it.” Ferguson, a native of Solon, joined the Iowa football team as a walk-on but was placed on scholarship this semester. He’s getting his first significant playing time this season after recovering from a pair of serious injuries. Ferentz believes Ferguson has a shot at playing in the NFL. Ferguson, an education major at the U-I, has said his long-range plan is to be a player development director for a college team.